Where’s Mario? Yoshi? : Arcangel’s altered Nintendo cartridge. For the first time since graduating, Cory Arcangel, OC ’00 was in Oberlin the past week, this time as a celebrated artist and lecturer. He has received accolades from art critics and has had his digital media art featured in exhibits at the 2004 Whitney Biennial and the Guggenheim Museum. His lecture last Tuesday gave an overview of his oeuvre in digital media ever since his days as a TIMARA student here. “The theme of this lecture is why I make what I do...some of my art has been based on projects I did at Oberlin,” Arcangel said, expressing the influence on his work from his days at Oberlin. Arcangel was invited by the New Media Arts Lecture Series, conceived and organized by senior Alicia Eler as a week-long series including a lecture, a screening and a workshop. For his lecture, digital projections of his works accompanied explanations of the processes through which they were achieved, as well as stories of his experiences at Oberlin relating to his art projects. When he dropped classical guitar in his second year to pursue a major in the TIMARA program, Arcangel had already been deeply involved with computer technology and its possibilities for art. Instead of exploiting the rapid progress of new computers to his advantage, Arcangel prefers to use antiquated computer systems to pursue his artwork. Arcangel and his friends founded BEIGE, a programming ensemble and record company run from his dorm room in Talcott. They conceived their project ideas over greasy fourth meals in Dascomb. One of their record releases was a vinyl called 8-bit Construction Set, a DJ battle record whose A-side is composed of music programmed on the Atari 800 and a B-side of music programmed from a Commodore 64, two early home entertainment systems. “The first use of vinyl for software distribution — ever,” boasts the Beige Records website. Arcangel was introduced into the art world when he first distributed his work over the Internet. His works since graduating from Oberlin, including his most well known, were displayed at the lecture. Mainly, Arcangel’s pieces are alterations of pre-existing media. Influenced by pop culture including MTV music videos and video games, along with the phenomenon of Internet “memes” and computer hacking (not the malicious kind, but as pranks), his art indulges in an ironic pop sensibility, possessing a quality of witty invention as well as novelty. “I am influenced by... Gary Larson, Andy Kaufman, Brewster’s Millions the movie, Ron Hextall the hockey player and Metallica, pre-1987, before the Black Album,” said Arcangel. It is difficult to tell whether he was being facetious or serious considering the ironic nature of his art. 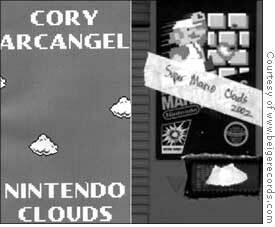 Arcangel’s retooled Nintendo cartridges have earned him the most acclaim thus far and include a Super Mario game cartridge altered so that only a blue sky and white clouds can be viewed on screen. Another of his cartridges, entitled “I Shot Andy Warhol”, is a version of the shooting game Hogan’s Alley, retooled so that Andy Warhol, the Pope, Colonel Sanders and Flava Flav would be included as shooting targets. His years of musical education are evident in his work involving music videos. One such work is the video “Beach Boys/Geto Boys,” which juxtaposes video footage and superimposes the music of the two groups, one being sunny ’60s pop and the other being gritty early ’90s gangsta rap. “The pitch and tempos of the two songs aligned to create odd harmonies, and...the juxtaposition shows the direction that pop music has taken,” said Arcangel of the unsettling effect created by his video. After resigning to the fact that his ambitions for a project called “Simons and Garfunkels,” in which several videos of Simon and Garfunkel performances would be superimposed to create the duo harmonizing with themselves several times over, could not be realized, Arcangel created nearly a hundred videos with the Simon and Garfunkel DVDs which thwarted his ambitions. “I thought [“Simons and Garfunkels”] would be my “Soup Cans,” and then I could retire...I spent a lot of money on those Simon and Garfunkel DVDs,” lamented Arcangel, joking about his unrealized pursuit. One of the videos he created from the DVDs, called “Sans Simon” is a projection of the duo performing “Sounds of Silence” in which Arcangel covers the image of Paul Simon with the silhouette of his hands. Working with composer Steve Reich’s technique of phasing, Arcangel created “Sweet 16,” a sixteen-minute video. The video superimposes two music video loops of the guitar intro of Guns N’ Roses’s “Sweet Child o’ Mine” with one loop stopping short one note ahead of the other loop, until the two loops realign after sixteen minutes. A jarring musical pattern is created in which the sounds become indistinguishable, one sounding like an immediate echo of the other. Arcangel is currently working on a new exhibition for this fall, examining the nature of the JPEG, and turning the film Easy Rider into an AOL Instant Messenger chat room log. He makes some of his music and videos free to download at www.beigerecords.com and maintains a blog on the website. He also makes his work reproducible to others by posting tutorials online. As an innovator in the field of digital media art, Cory Arcangel feels a sense of duty to share his work by removing it from solely being displayed in museums and galleries, and exploring the Internet as a venue of exhibition.